The star has been retired since 2016. Tim Duncan pretty much kept a low key life after retiring in 2016. After 19 seasons on the basketball court, the retired Spurs star hasen't really been on the basketball court publically until now. Duncan was honored for his charitable donations to the Virgin Islands community from the hurricanes last year. 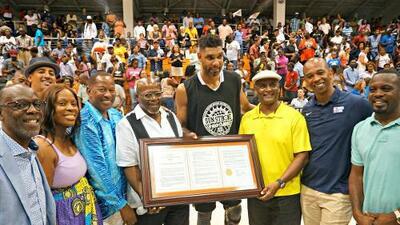 Duncan was honored by the Virgin Islands Gorvernment and he played in the Hoop Classic on Saturday, August 11th at the University of the Virgin Islands Sports and Fitness Center.